← Muhammad “The Prophet”, in the Genealogy of the US President ? Mystery Painting mother Mary, and sentence Tawheed “La ilaha illallah”. In the Louvre Museum, saved Painting by Ugolino titled “The Virgin and the Child”. 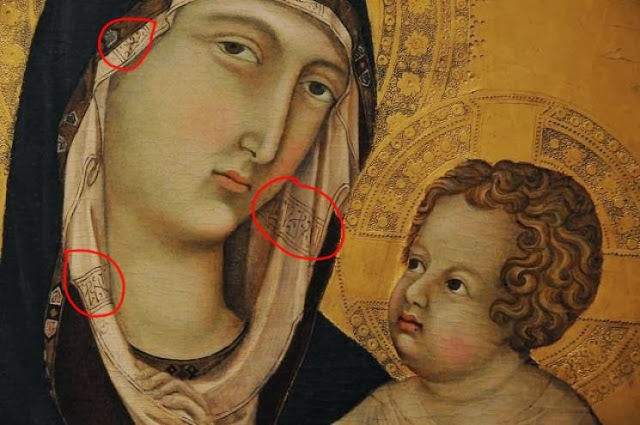 If observed closely, the hijab “Mother Mary” in the painting, there are Pseudo Kufic Arabic script. Studied by researchers that after the Arab World Institute, it turns out writing is “La ilaha illallah”(for a larger image, click here).